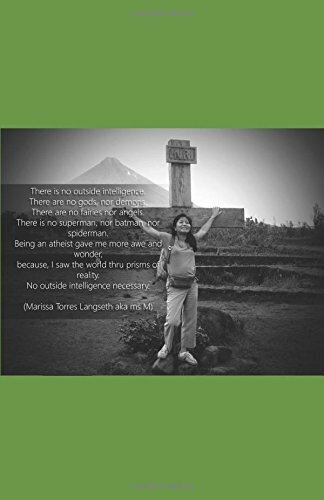 An autobiography of Marissa Torres-Langseth, HAPI Founder and Chairperson Emeritus, ‘No Outside Intelligence’ is a narrative of her colorful life, full of childhood events that led to her skepticism, atheism and evolved humanism. A humanist from rags to riches, but remained generous and giving, because she knows how it was to be poor and to grow up without anything. She came to the USA with only $30 USD in her pockets. She was frugal, worked three jobs at one time to make ends meet, and went back to school, always saving, always on a budget, and bought only what she needed, until she married the love of her life, a WASP (White Anglo-Saxon Protestant). Love and respect have no boundaries nor religion. They have been married for over 22 years as of this publishing. 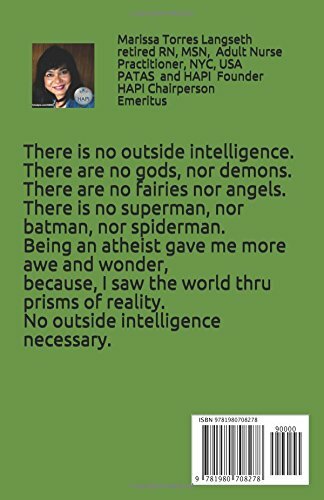 Ms. M, as she is better known, is the pioneer in founding non-religious, SEC-registered societies in the Philippines: PATAS (Philippine Atheists and Agnostics Society) and HAPI (Humanist Alliance Philippines, International). Both are thriving non-religious societies, however, only HAPI is well funded by Ms. M herself. HAPI has regular community outreach and educational events, also funded by its international affiliates, some donors, and supervised by the new Board of Trustees. Read about her growing pains founding the two non-religious societies in an overly religious country. The Philippines is 80-97% religious. Read how people reacted to her two societies. Read how she suffered, read how people jeered at her — the very people she loved and protected, and even stole her hard earned money, causing her to almost break down and take her own life out of frustrations. Read how she succeeded despite roadblocks from theists and atheists alike. The objective of publishing this book is to propagate humanism specifically in the Philippines, so that we can all live good lives without god belief. Proceeds of this book will go to HAPI as part of her legacy. This book was created to educate, and not for fame nor fortune. Do good because it is the right thing to do. Cherish every moment of your life because we have only one life to live. There is no supernatural being above nor below us. We can lead good lives, with awe and wonder, no outside intelligence necessary.